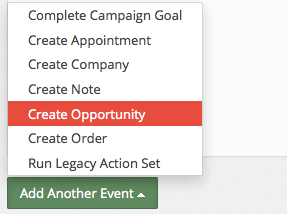 Select Create Opportunity from the Add Another Event dropdown menu. Manually set the value - If you manually set the value, the title of the opportunity will be the same for every lead that comes in. Use an extracted field - If you use an extracted field, you can populated the title of the opportunity with the content for the parse that you specify on the right. Here you can set the stage of the current opportunity. If this is your first contact with the lead, set it the New Opportunity. 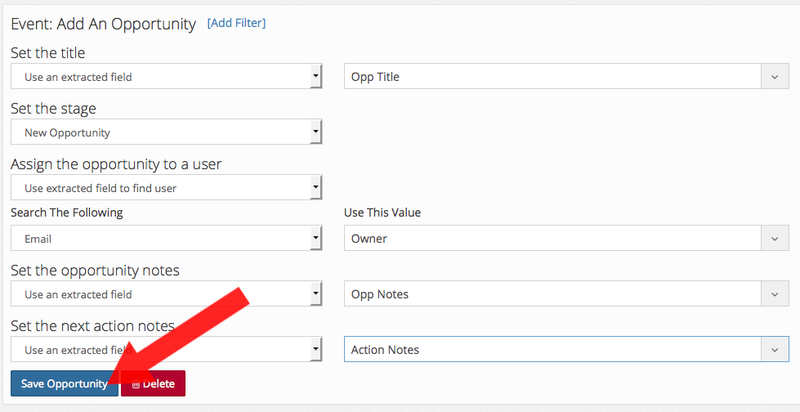 Same as before, you can manually set the value and have the same user assigned to an opportunity every time, or you can use an extracted field and use a value determined by the email. Here you can set notes for each opportunity. Here you can set notes for the next action you will take. 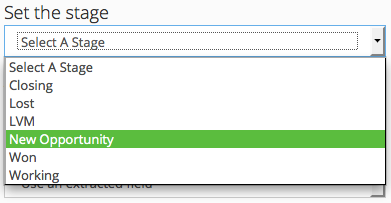 Once you are finished with the configuration, just click Save Opportunity, and you're done!